Thank you all for participating in what has been the most difficult Pow Wow ever. The mud on Blackstar threw a whole new element into the mix. It was a Vision Quest not only for those of you actually participating in the Vision Quest event, but in the Counting Coup as well. There will be changes to the 2006 Pow Wow but they won't be as severe as first proposed; more on that at the end of this after event letter. From the emails of support I received I realized that the majority of you understand that the Counting Coup and Vision Quest are about more than finishing, they are about giving back. 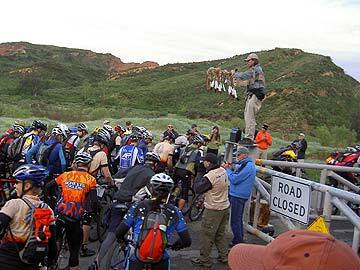 You understand that because of this event, the trails are maintained at no cost to the public. You understand your event fees directly support our maintenance programs, public outreach and legislative action to protect your access. That the journey is as important as getting to the finish, for it is in the journey that the lessons are learned and the Vision revealed. Many of you expressed this to me in inspiring words I will never forget. 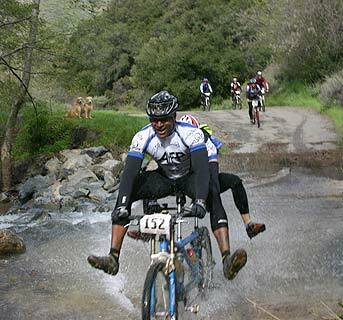 A good example of this is Tim Panttaja, who with his wife Sherry, own Switchback Cyclery. Tim was diagnosed with cancer over a year ago and went through surgery and Chemo. 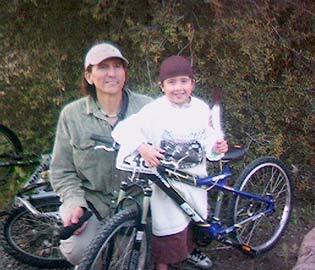 Tim set his vision on finishing the Vision Quest, which he did. You are an inspiration to us all Tim. Our two youngest members of our race team, 7 year old Troy and 12 year old Lacey, attempted to ride their age division Vision Quest. But the mud zapped their strength. Troy made it up past Beek's Place before he and his dad turned back. Lacey made it to the Motorway past the cutoff time. Both of these amazing kids still had smiles on their faces. They and their parents should be proud of their determination and attitude. I am deeply thankful to all of you for sharing these and many other experiences with me and for all your emails of support; they helped ease the pain of the criticism I received. We had several new records set. As you all know we returned to the course we used 5 years ago extending the end all the way out Trabuco Road. Cameron Brenneman of Mission Viejo Calif. set a new Vision Quest course record of 5:26:31. Cameron is an amazing athlete and a great guy. He holds the course record on the old course. John Mylne of Arcata Calif. set a new course record on a single speed with a time of 6:45:26. Warrior's Society Race Team member Leslie Williams of Costa Mesa Calif. set a new female Vision Quest course record time (on a single speed) of 8:11:52. She holds the women's single speed record on the old course. Calvin Mulder of Tustin Calif. set a new fixed gear Vision Quest record with a time of 7:25:19. Calvin holds several course records on the old course, including the running record and single speed record. In the Counting Coup Johnny O'Mara of Laguna Niguel Calif. set a new course record time of 4:29:28. Regina Froemmling of Laguna Niguel Calif. set a new female course record time of 5:56:10. Dirk Venzlaff set a new course single speed record time of 6:51:20. 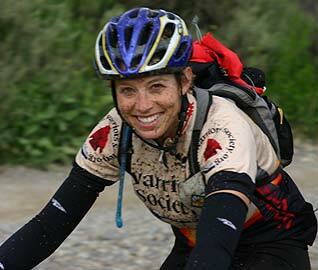 Molly Hartsough set the first female record time on a single speed with a time of 7:50:09. Amanda Eakins and Hugh Harris set the first coed tandem record with a time of 7:41:45. A photographer took photos of many of you and has arranged the photos by bib number and made them available on the web. Riders are free to right-click and save their photo to make a small print or just view on their computer. If they really like it they can contact the photographer to get a nice full size print priced at cost. John Early has also posted some great photos that he took at the event. » 9:30 a.m. at the intersection of the Silverado Trail and Maples Springs Road (Counting Coup and Vision Quest). » 12:30 p.m. at the base of West Horse Thief (Vision Quest). I want to focus on the local community doing the events, especially those involved in maintaining the trails in the Trabuco District, the home of the Pow Wow. They will get first preference in positions. Special guests from Arizona, such as Rudy Nadler and 5-10 single speeders of his choosing will also be welcome. I will drop the participation limit to 125 to 150 for the Vision Quest (190 this year) and raise the event fee to $125 from $100. The Counting Coup event will remain at 100 participants and $75. If we are in good financial shape prior to the event I may drop the participation limit on the Vision Quest down further. This would really help make the event run smoother; less participants will make the event more intimate for the local community. It is not my goal to have a big event, it is not my goal to have a famous event, it is not my goal to have an event that makes us rich; my goal is to have an event that makes a contribution to the community and gives back. For too long competition has replaced self-sacrifice for the good of others. The Warrior's Society members of the plains tribes were not only tested physically, they were expected to protect the tribe and their land; to sacrifice even themselves to protect the tribe. This is the only reason why the Vision Quest and Counting Coup exists - to honor these Warrior's of the past. I consider the trouble experienced during this Pow Wow the result of losing that focus and have only myself to blame. It's time we returned to our roots. We all know the Pow Wow would not have been possible without our many volunteers. Many hours went into making the 2005 Pow Wow happen. Aid Station #1 - Matthew Forrest, Pat Burton, Robert Blain, Art Zipple, John Durfee, Garrett Broughten, Lubos Durdovic, Mary Ann Profeta, Mark Cluttey, Eric Muyderman, Chris Dodge, Suzanne and Mark Wilson. Many thanks to all those that chipped in to clean the bikes and to Switchback Cyclery for providing cleaning brushes, cleaner and chain lube. Aid Station #2 - Jesse Vargas, Joe Durning, Joe Beldoza, Andy Darragh, Hal Sintov, James Hahn, Rodney Graham, Wayne Hermes, Jay Castleberry, Steve Foster, Kriss, Bob Stuart, Jim Williams, Dwayne Williams and Wade Williams. West Horsethief Check Point - Brian Ephraim, Dan Gallagher and John Huth. Trabuco Check Point - Bill Hines and his son-in-law. Finish Line - Jane Lemonds, Robin Lemonds, Tammy "Girlfriend" Martin and Sheryl Condon (both Tammy and Cheryl also worked on the awards). Finish Line software programmers - Jeroen and Debra Bosboom. Ham operators - Frank Hayes, Brian Sampson, Steve Bass, Craig Konrad, Mike Syverson, Adelaide D'Ippolito, Jack Coy, Tom Hobbs, Tony, Richard, and Heiko. Our other Main Divide 4X4 support volunteers Michael Ramer and Jim Warren. The Orange County Dualies and all our dual sport volunteers - Larry Barnett, James Beatty, Jim Dekker, Bob Ewing, Clark Farrell, Allison Hughes, Gary Johnson, Randy Ressell, Ron Salcido, Ron Sobchik, Dennis Towgood, Colin Young, Jerry Young, Wayne Rollins, Brian Empter, Josh Jacquot, Ken Rands and Chris Horgan. Our EMT staff - Paul Romero, Jay Gentile, Ryan Ortiz, Carlo Marzocca, Brian Habegger and Scott Smith. Staging Area Coordinator and Truck Driver Patty Taylor. Our Shuttle Truck Drivers, Reed Price, Bob Hale and Karen Lundgren. Our Web Master Barry Wood for his constant attention to our web site and patience with posting the final times. Geriann Vargas, Jesse Vargas and Gena Vargas for helping to clean up and pack up the next day. They, and Ned Reynolds, also helped load up the day of the event. The U.S. Forest Service and Rangers Judy Behrens Virgil Mink and Debra Clark. Our sponsoring bike shops: Jax's Bicycle Centers, Rainbow Bicycle Company, Edge Cyclesports, The Bike Company, Switchback Cyclery, The Path Bike Shop, Rock and Road and South County Cyclery. Our contributing sponsors: Titus, MTBAccess, Minute Maid Orange Juice, Voler, The Indian Store, Active.com, Kona, Mountain Biking Magazine, Yakima, and Trek. 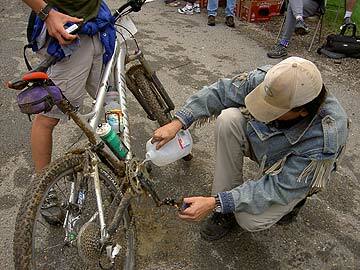 Please support these companies that contribute to keeping the trails open. We have produced a DVD about the 2004 Pow Wow. Click here to find out more. No 2005 Pow Wow DVD will be made. We all know this was a trying year for all of us due to the constant rain; but for the most part we adjusted. It was as much a Vision Quest for me as it was for you. It is my hope that we never again have a year as difficult as this one has been. I am honored to be in the company of so many great Warriors. May the Great Spirit guide you on all your Vision Quests; no matter where they take you.